Today’s article mainly discusses cotton. In Part 2, I’ll cover linen and blends. The talk opened with a discussion between fiber and weave. Fiber is the raw material that goes into fabrics. A “staple” is the natural fiber that is spun into yarn. A “weave” describes how the yarns are woven into the fabric. 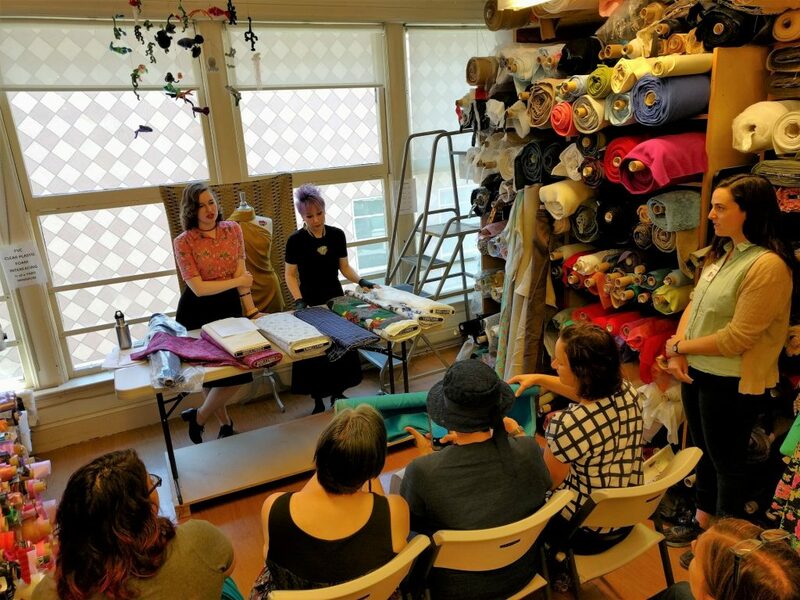 Though both fiber and weave affect the characteristics of a fabric, most of the talk was about fibers rather than weave. Both cotton and linen are natural fibers – they are plant-based, and made from the cellulose that forms the cell walls of the plant. The length of the staple hugely influences the qualities of the fabric. The highest quality fabrics are made from extra-long staples. Cotton is a relatively short-staple fiber. The short staples from the fluffy part of the plant are spun tightly to make a strong thread. The remaining cellulose from the cotton plant, after separating the fibers, is used to produce rayon. The best cotton fabrics use extra-long staples. Long-staple cottons are smooth and cool to the touch. They wear well, because the fibers are stronger, and have fewer tiny abrasions that wear down over time. They fray much less, are much less “fuzzy” than short staple cottons. Colors stay truer with less fading in long-staple cottons. Pima cotton is made from extra-long staples. It is produced in America, where the name comes from the Pima Native American tribe. Most Pima cotton is exported to other countries to be spun, but you can get 100% USA manufactured Pima fabric that is harvested, spun and woven all in the USA. Pima cotton has a crisp, smooth hand, and feels glossy. This is a trademark for a Pima cotton that is 100% American grown (“Superior Pima”). Sea Island is named for the islands off the coast of South Carolina. It is related to Pima Cotton and is another gold standard for high-quality cotton. Though this name is associated with high quality cottons, this is not always the case. You should always check quality first when buying an Egyptian cotton. Comfort level – cotton garments are comfortable to wear. Moisture absorbency – the plant-based fibers absorb moisture readily and wick it away from the body. Conducts heat away from body. Breathes. This is especially true compared with synthetics such as polyester, which are basically plastic. Durable, especially the finer and tighter weaves. Drapes well, due to relatively short staple fibers. Not much elasticity, does not bounce back. Cotton fibers are also stronger when wet than when they are dry. This is typical of cellulose fibers, and is one reason why cotton fabrics wash well and can be put in the dryer. Wool fabrics are more delicate when wet, which is why machine washing is not recommended for them. Here’s some disadvantages of using cotton. All cotton fabrics shrink when washed. What’s interesting is that the cotton fibers do not shrink, but the fabric does. The yarns in the fabric are stretched in the weaving process, due to tension on the loom. When the fabric is immersed in water, the fibers relax and draw back up. Cotton does wrinkle, and requires pressing. There are some finishes and treatments for no-wrinkle cotton. (Finishes are discussed below). Cotton soils easily, because the short staple fibers grab on to dirt. You should launder cottons as soon as possible after they become dirty – if you let a soiled garment sit, it can degrade the fibers. Though cotton is an easy fabric to work with, there are still things you need to know to get the best results. 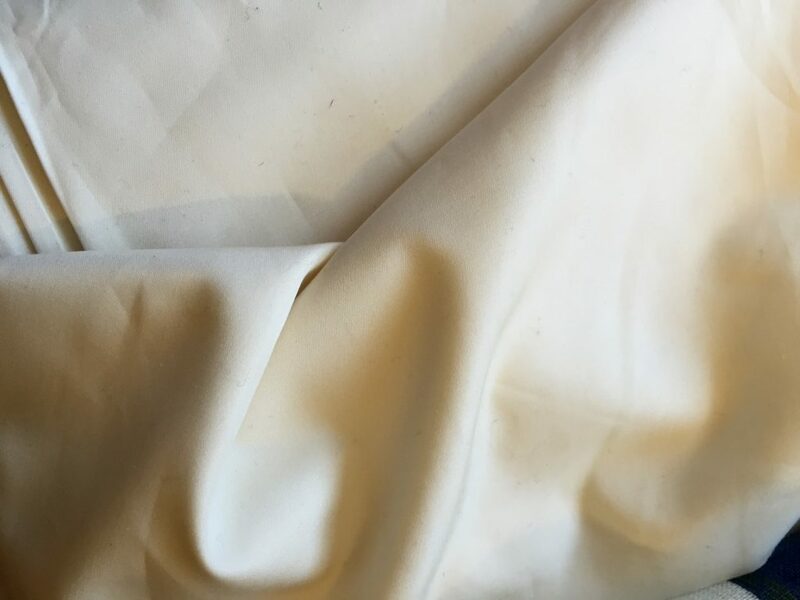 Some cotton fabrics have a finishing applied to them. This is often a glaze applied to the fabric, with a hot-press method. It makes a cheaper quality fabric seem smooth, but the finishing washes out, leaving a fuzzy fabric. You should always pre-wash the fabric to check. Cotton is woven with tension in both directions. The tension along each direction can be different, so the shrinkage can vary in each. Preshrink in the washing machine, using cold water for prints or delicate fabrics. Hot water shrinks more but is harsh on the fibers, so a warm-water wash is recommended for most cottons, especially for more durable weaves. Most shrinkage occurs on the first wash.
Dyed fabrics, especially indigo dye, are subject to crocking – where the dye can rub off on hands and other fabrics even when the fabric is not wet. Wash colors by themselves, and add a scrap of white muslin to the load to test for bleeding. Most cotton fabrics are slightly off-grain coming off the bolt. The loom tension means fabric can get skewed as they are removed from the loom. The fabric must be on grain if the garment is to hang properly on the body. Seams can pucker if the fabric is not on grain, and pockets will not hang or place properly. To check and straighten grain, pull a horizontal thread from the fabric, and check against the lengthwise fibers with a square or other 90-degree angle tool. To straighten the fabric, grab it at opposite corners and give it a sharp tug, then press with an iron to set the fabric in its new orientation. If a print is off-grain, you have two choices. You can cut it off-grain, and risk problems with the finished garment. Or you can cut on-grain and have the print go crooked. Selvages are packed more tightly than the weave of the fabric. They can shrink differently in the washer, and pucker the edge of the fabric. You can consider cutting off the selvages before prewashing, or make a snip into the selvage every so often to release the tension. Or, don’t cut fabric near the selvages. You’ve heard this one before. Always press when sewing seams. Press every step of the way – press them flat, press them open, etc. Cotton takes heat well. If you are making a tailored garment from cotton, consider dry cleaning to preserve the structure of the garment. Cotton takes dry cleaning well. Thanks to Chuleenan Svetvilas from the Bay Area Sewists for sharing some of her photos for this article. Love this blog: I learn a lot with every article! Thanks for sharing all this information. Can’t wait for the post on linen. Thank you for all this information in an easy to read format. Thanks for the photos! I didn’t want to steal your thunder from the blog post you wanted to write, but if I’ve saved you time that’s good!